By 1912, it was believed that by relieving the symptoms of an infected animal it would greatly assist mother nature in helping the animal overcome the disease. A teaspoon of alum, chlorate of potash, boracic acid, or one-half teaspoon of the tincture of aloes and myrrh placed in the mouth was thought to be effective. Another treatment involved having the animal stand for five to ten minutes in a trough containing a one to one thousand solution of bichloride of mercury or a three percent carbolic acid or creolin solution. In a case where the teats or udder were affected an application of carbolized vaseline, camphor ointment, or borated glycerin was thought to give excellent results. A dose of phenacetin was recommended to reduce fever. During the animal's sickness it was recommended that the animal be fed on soft meal or grain and given a plentiful supply of clean water. By 1916, it was realized that medical treatment such as that which was practiced in 1912 was a danger in itself. The threat of the disease spreading as a result of medical treatment was just too great. Farmers became more interested in preventing spread of the disease. Disinfection of an infected stable was accomplished by scrubbing the floor with hot water, brushing down all loose dust from the walls, and tearing off all woodwork which was partly decayed. Then the whole interior of the stable was disinfected. They used a 5% solution of pure carbolic acid or Chloride of lime, U.S.P strength (30% available chlorine), Formaldehyde, or a 3% solution of cresol compound. All stable utensils were thoroughly disinfected by the application of one of the previously mentioned solutions. Scientists discovered that a sodium hydroxide in a 1-2% solution destroyed the foot and mouth virus in about 1 minute. This preventive was described as cheap and convenient. This solution was used for disinfection wherever needed. Manure was burned or disinfected and spread over ground (other than meadow land) that was to be turned under. No other cattle were brought onto the farm for at least 60 days after the complete disinfection of the premises. 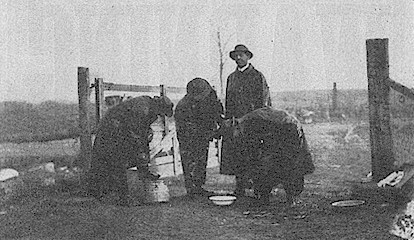 In later outbreaks, inspectors wore rubber clothing, which could be disinfected. They were required to fumigate and disinfect themselves before leaving inspected premises. 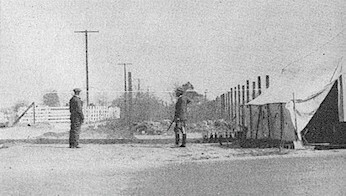 The quarantine method consisted of keeping all of infected animals away from all other animals and people. The method used depended upon prevailing conditions (laws, regulations, economics). The quarantines involved infected animals, premises, and territories. Whether the animals were infected or just exposed, they were quarantined and only one person could tend them. Dogs, cats, goats, and poultry, which usually had access to the stables and barnyards were kept away. The slaughter method was used extensively in the US and England and included slaughter of diseased animals, then burning and burying of the infected carcasses. Then the premises were disinfected. 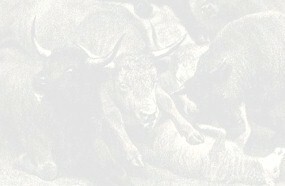 In 1916, for example, infected animals were purchased and slaughtered. The carcasses of these animals were then destroyed by cremation, or otherwise by burying 6 feet deep and covering them with air-slaked lime. Farmers were reimbursed for slaughtered animals, with a value determined by an official agreed upon by State and Federal government authorities. The owners were paid the stipulated amount based upon the meat or dairy value of the animals as appraised. The Virus-Serum-Toxin Act of 1914 prohibited shipment from one state or territory to another any virus, serum, toxin, or analogous product that has not been prepared at a plant holding an unsuspended and unrevoked license from the Department of Agriculture. 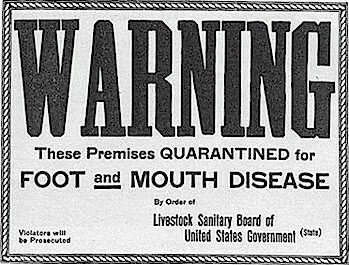 One Foot and Mouth outbreak which lasted from October 1914 to November 1, 1915, included over 168,000 animals slaughtered, valued at approximately $5.6 million. It should be noted that the Foot and Mouth Disease discussed here is not the same as Hand, Foot and Mouth Disease in humans.